click link to Right for LARGER view. Main Building: approximately 7,000 sq ft, plus exterior porches & plaza = approximately 9,000 sq ft overall. 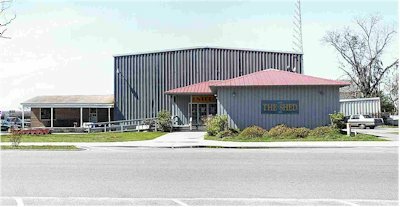 Main Warehouse: options include: retail, auctions, cafe' seating (with small table/2 chairs), row seating, dinner theatre, art exhibits, conference settings, presentations, dance concerts, multi-media presentations, musical theatre-concerts, etc. Pre-wired for Fiber Optics (to Charter Communication). Access to Plaza areas, both levels. Loading Area: truck-loading/unloading dock area w/roll-up door access to truck ramp, workshop, set storage & construction, etc. Access to Handicap Access Ramp to rear parking area via front porch of Multi-Use Building, on 8th Street. 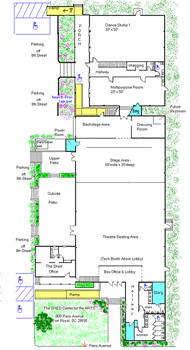 Entrance & Restroom Wing: Two large restrooms, storage closets and water fountains. Handicap Access Ramp to Main Warehouse level from parking area. Multi-Use/Office/Education Building: approximately 5,260 sq. ft overall. (4661 sq ft heated; 600 sq ft front porch). 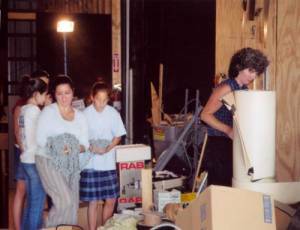 1st Floor: Studio 1 (professional dance surface over sprung floor, mirrors & barres); Hallway with Stairs to 2nd floor, Storage closet, Changing Room, 2 Restrooms; Studio 2 w/sink, mirrors, storage closet. Pre-wired for Fiber Optics (ties into Charter Communications). 2nd Floor: Studio 4: carpet, w/ washer & dryer hook-ups. 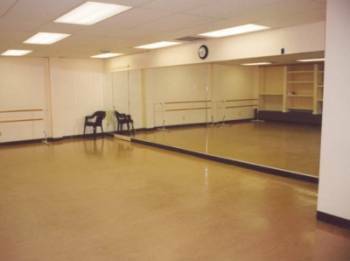 Studio 3 professional vinyl dance surface over wood floor, mirrors, built-in storage wall, storage closet. Access to exterior stairs to front porch of building. Small Brick Building: "As Is"; approximately 600 sq ft interior; 170 sq ft for exterior porch.